Not all of us are lucky enough to own our own truck/trailer for trailering our horses where they need to go. So if you are not hiring a professional hauler and are instead using a friend to help you out; please be sure to compensate those friends fairly! You don’t want to cause frustration or separation in the friendship because of a trailer trip. First, be honest with your friend. 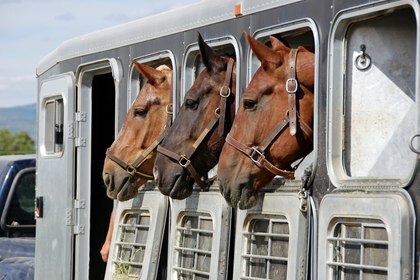 If your horse is not a great hauler; let the friend know BEFORE they agree to take your horse anywhere. 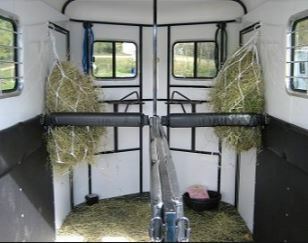 Second, understand that any damage your horse may cause to the trailer is your responsibility. Next, a barebones cost of gas is about $0.25/mile (give or take on the truck). This does not factor in your friend giving up their time, the wear and tear due to mileage, the insurance they pay, or the cleanup after your horse has exited the trailer. This also doesn’t take into account the miles your friend drove to get to where your horse is, or to get home from where they are dropping off your horse. OK, so what should you pay your friend for trailering? Well, according to the IRS, the 2017 Mileage Reimbursement Amount is $0.535 cents per mile. Assuming the person driving the miles is also getting some form of hourly/salary wage. If your friend is going the same place you are; then it is typically fair to just share gas costs (or split between however many horses are in the trailer).. and maybe be nice and buy them a lunch for doing the driving and being kind enough to share the ride with you. If your friend is NOT going where you are, have an honest discussion with that friend about what they expect. But don’t short change them and offer them $25 for a 100 mile trip because that is all the gas they theoretically will have used. Commercial haulers typically charge between $1-$2 per mile, so a fair price for a friend would be in the range of $0.75 per mile. Some other key factors to note; you will need a hay bag with hay to entertain your horse and keep them happy/healthy during the trip. If the trip will be over 2 hours, be sure to have water available to the horse (whether it is mounted or you stop to offer the water). Be ready to load up when your friend arrives; have tack, supplies, etc ready to load immediately. If you don’t have any of the items needed, see if your friend does. But remember be prepared to replace them if your horse damages the items. Be prepared to help clean out the trailer if your horse has made a mess. Plan extra time for the drive; trailering a horse takes longer than driving a car; give your friend ample time to drive your horse safely where they need to go.